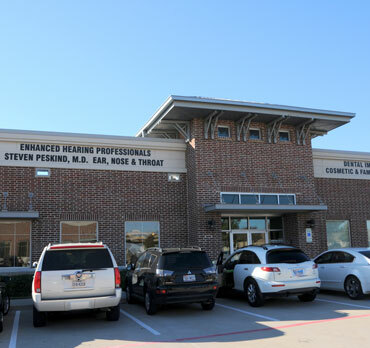 The ENT office of Steven Peskind, MD, is conveniently located on the southwest corner of Windhaven Parkway and the Dallas North Tollway, immediately in front of the Plano Dermatology Building. Drive up and handicapped parking is located in front of our building facimng the Tollway. Come south on the Dallas North Tollway and exit Spring Creek Parkway. Stay on the service road to Windhaven Parkway and make a right. Turn left into our six-building complex. Our building is the first building closest to Windhaven immediately in front of the Plano Dermatology building. Come north on the Dallas North Tollway and exit Windhaven Parkway. Turn left onto Windhaven and pass under the Tollway. Take the next left into our six building complex. Our building is the first building closest to Windhaven immediately in front of the Plano Dermatology building.